The stylish Shire Barn Double Door Shed oozes charm and quality. If you’re looking for something more than a simple storage space then this is an outstanding choice. 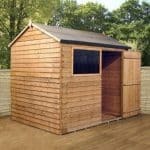 Created by one of the leaders in the industry, this shed comes packed with excellent features. As well as boasting a superior quality exterior, the interior is also furnished to a high standard. The floor has been manufactured with tongue and groove cladding, making it also ideal for use as a workshop. It features wide, hinged double doors and a panelled, stylish opening glass window. Technically the shed has an apex style roof, though due to the barn design it does look a lot different to the traditional apex style. However, whilst it may look different it still gives the building the same benefits as a traditional apex, such as excellent water resistance and brilliant internal height. 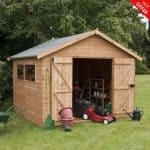 Spacious enough to store large equipment yet compact enough to fit into most gardens, this is an exceptional shed that will look amazing for many years to come. Though supplied with a basecoat treatment, the building does require annual treatments to maintain its durable design. The double doors come with a pad bolt that allows you to secure them with a good quality padlock (not supplied). Padlock not included. Shed Store do provide alarm padlocks however at low, affordable prices. This is a storage shed with a very unique design. As it is built with a tongue and groove floor, it could also be turned into a small workshop or be used as a home office if you add power to the building. It has an extremely tall build, ensuring even the tallest of equipment can be stored in here with no problems. The height of the doors is also slightly taller than average, as is the width. All in all compared to other similar size buildings this one does offer slightly larger measurements for your convenience. The unusual roof is the signature feature of this shed. It may only be constructed from solid sheet materials, but its design is extraordinary. It is described as having an apex roof, though as you will see in the photo, it doesn’t have the traditional apex look. However, it does still provide the same excellent level of resistance to rainwater as a more traditional roof. The floor is equally as impressive. It may not have a fancy design, but it is built with tongue and groove to give it maximum strength. This is what makes the building suitable for multiple uses. Shiplap tongue and groove features on the walls of this shed, giving it a really smooth, professional design. Shiplap is notorious for its extreme weather resistance, as well as its attractive style. A small indentation located between every panel is used to drain rain away from the shed, stopping rot and fungus developing over time. The tongue and groove aspect of the assembly is also important as it doesn’t just make slotting the panels together easier, but it also leaves a small expansion gap between them to ensure any warping over the year doesn’t affect the structure of the shed. It also uses a thicker frame than most competitor sheds, measuring 34mm x 34mm. It is unusual to see that only a basecoat treatment has been provided. 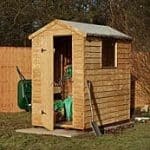 Within this price range you’ll find a lot of sheds offered by Shed Store come with dip treated or even pressure treated walls. A basecoat treatment is the lowest type of preservative used and will only offer protection to the timber throughout transit. Therefore you will need to add your own treatment after construction and annually afterwards. Out of all of the sheds we review, we particularly love the barn style models as they come with exceptionally large doors. The height and width of the double doors included on this building make storing absolutely anything a breeze. The sheer convenience and comfort offered is outstanding and the only thing we can really fault is the fact they aren’t braced. We also really like the style of the window. It benefits from an attractive panelled design which blends in perfectly with the barn style. It is also openable which is another massive benefit, as it allows you to get good air flow into the shed, protecting your storage from mould and condensation. They are glazed with horticultural glass and also benefit from mitred profile beading which means you won’t have any awkward cutting to worry about during installation. With just a pad bolt and no padlock included, the security will need to be improved if you don’t have a secure garden. We’d recommend buying a padlock anyway as you never know when an opportunist thief might come along. Privacy wise there is a window, though with it being panelled it isn’t as easy to peer through as a solid window. One thing you may worry about because the window is openable is whether someone will be able to climb through. The good news is the window does lock from the inside so as long as you keep it closed when you aren’t around, it won’t be easy to get through. One way to improve the privacy is to hang curtains or a blind if preferred. The only customisation option available with this stylish shed is the choice of window placement. It can be moved to any fully boarded panel. The good thing about this is that you can install the shed on either side of the garden. You can also make sure you add the window to the most private side. The choice of extras available also isn’t amazing. We are especially surprised to see that Shed Store haven’t included a padlock in the extras. They sell them and as there is a pad bolt added to the door it would be logical for the company to add them as an extra. So we recommend you browse the site and choose one of their high quality alarm padlocks to make sure you are protecting your storage against theft. The one extra that is provided is the wooden base with adjustable spikes. 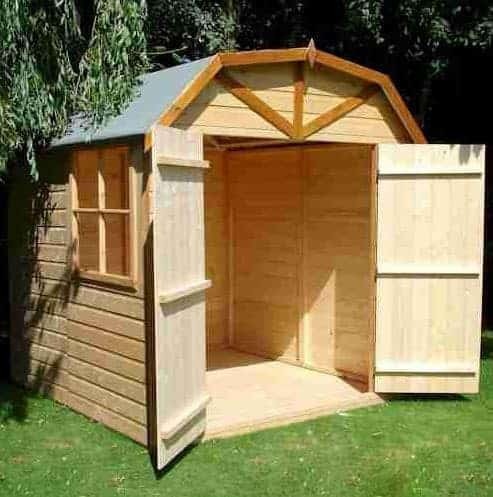 It may seem like an expensive extra to invest in, but if you only have grass or soil to install the shed on top of, the base will ensure the floor is protected against rot. 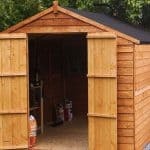 It also speeds up the assembly of the shed and the adjustable spikes ground the base into the floor to ensure it remains sturdy all year round. The use of tongue and groove inside the shed as well as on the outside is a nice touch. This is a high quality building with a very attractive design. Though we would have liked to have given this shed 10/10 for longevity, we feel we need to take into account the annual treatments. Most sheds require annual treatments however so this isn’t a disadvantage specifically seen with this model. 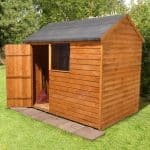 This is a tall shed with spacious access, though it is one of the smaller models on the market. The good news is it will fit into most gardens with ease and can hold all gardening and outdoor essentials. The shed may have a unique, more detailed design than your typical shed, but it is apparently very easy to put together. In fact, one customer even referenced it as “fitting together like a 4 piece jigsaw”. So you shouldn’t have any trouble assembling it. 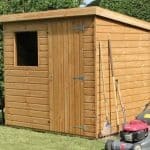 Even though you will need to pay a little extra to upgrade the security of the shed and annual treatments are necessary, this beautiful shed offers excellent value for money. Final Thoughts: This superb barn style shed offers an alternative, stylish look to the traditional apex shed. It will complement any garden and provides a spacious interior to store all kinds of equipment. Wide double doors, a beautifully panelled opening window and exceptional interior height are just some of the main features of this building. The tongue and groove floor is an excellent addition, enabling you to keep heavy machinery and equipment in the shed without worrying about the stability of the floor. It may cost a little more than similar sized buildings, but for the features and style you receive, the cost is definitely worth paying for.